No matter how smart and modern your sewing machine is, any sewist – be it a beginner or a professional needs to know the hand sewing basics and the main hand sewing stitches. You will need an appropriate needle, thread and a needle threader. The finer the fabric – the thinner the needle you should use. The needle threader will save you time and will eliminate the sense of frustration of being unable to get the thread through the tiny needle eye. 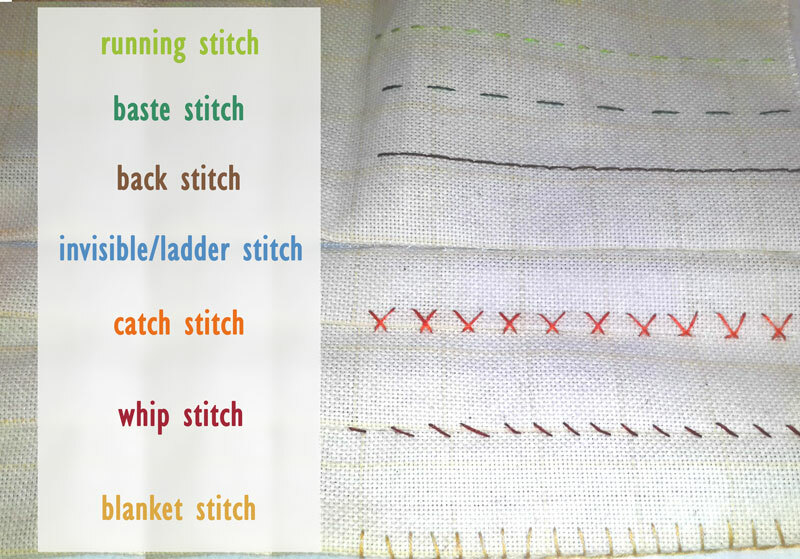 Here is an easy guide to all you need to know about the main hand stitches and ways to learn how to do them. This is a small stitch which is used for attaching fabrics together or for joining fabric at the seams. Use a single thread with a knot at the end and make several of the running stitches at once, so that it goes faster. Once again, make sure that the thread is neither too loose nor too tight so that the two pieces of fabric remain flat. Once you are done, secure the end with a few back stitches. This is a stronger and more secure stitch which done with a single thread. Make a single stitch in and out of the fabric, and then go back with the needle to a spot before the previous stitch came out. Then bring your needle one stitch ahead of the previous one. Once you are done, the front should look straight and neat in a row, whilst the back should have longer and overlapping stitches. Make sure the fabric is flat by avoiding stitching too tight or too loose. This one is for hemming, and the thread keeps going over the edge of the fabric in order to enclose it. This stitch is similar to the whip stitch. It is used for safe finishing of the fabric edges in order to keep them neat and to stop them from getting unraveled at the raw edges. The overcast is made with short, diagonal stitches over the edge of the fabric. You should start from the back of the fabric at ¼ of an inch from the raw end and pull out the needle at the front. Then go to the back again, so that the thread encloses the raw edge as you go. Make sure you maintain the same spacing and stitch length. Double overcasting involves crossing the diagonal stitches over and forming small x-s as you go. The double overcast stitch will give your fabric edges a very smooth finish. This is the one to use when you want to make a hem which has some stretch. It resembles the herringbone. The needle catches a couple of threads from the first fabric and then should go to catch the same amount of threads from the second fabric. It is also called buttonhole stitch as apart from edging blankets, it is also used for making buttonholes. The stitches are spaced at a quarter or half inch apart. Start from the back of the fabric and bring the needle at ¼ of an inch from its end. Pull the threat through to the front. Then place the needle at a very small distance from the previous starting point and pull it from the front to the back of your fabric. Place the thread beneath the needle point and then pull it out. Three ways to call the same thing. This is an invisible hand sewn stich which is used for hemming. Pull the needle through the folded hem of the garment, then pull it out in order to catch a few threads of the fabric and push it back through the folded hem. The less visible the thread is from the front of the hem – the better. This is another one you can use for sewing your hem without the threat being visible from the front of the fabric. Fold the hem and pull out the needle and thread from behind the fold. Once your needle comes out vertically catching two threads of the fabric you should proceed to make the net stitch. Once you are done, only tiny dots of thread should be visible. Used as a decorative one, this involves carrying the next stitch back only at half the length of the previous one. Once you are done practicing, you can start hand stitching your actual project. Even though it may seem old fashioned and outdated, hand sewing is an essential skill which every sewist should learn to use for the appropriate sewing tasks.